So my oldest unfinished sewing object is finally finished... and I can't decide if I totally hate it or find it mildly acceptable. I mean, there are a few pros here: it has raglan sleeves, it's an adjustable wrap style, and it's made from a stretchy (but not too stretchy) chartreuse RPL doubleknit. Plus: a peplum! But... there is a big con here, and that is the poor fit. It's just way too huge all over—in the sleeves, the shoulders, the body, the front. Even when I wrap it as carefully as I can, it feels more "ill-fitting bathrobe" than "casual, yet chic jacket" to me. 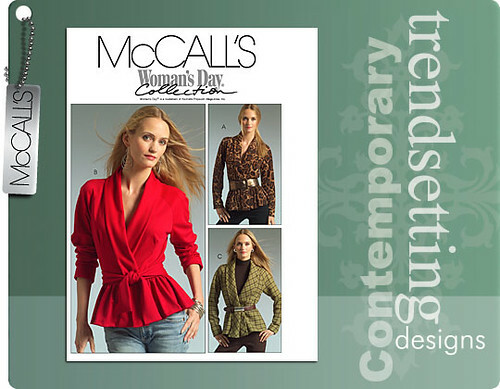 Pattern: McCall's 5529, a self-belted unlined raglan-sleeved cardigan/jacket with peplum, designed for wovens or stable knits. I believe it's out of print in the envelope edition, but I bought it as a download from SewingPatterns.com and tediously taped it all together. I made View C, with self-fabric belt and smooth non-gathered peplum. But I don't think I really recommend this pattern. The collar doesn't seem to know what it wants to do, the belt is rather "meh", and the peplum could be more fun, but isn't. Fabric: Chartreuse Sophia doubleknit rayon/poly/lycra from Fabric.com (similar here on sale for $8.99/yard). It's a great fabric... BUT I think this would have worked better in a softer knit—like a sweater knit or stretchy French terry. Size: According to my old notes I made a size 14, did a 2" FBA (adding four inches across the bust total), shortened the body by about four inches to hit my short waist... and added quite a bit of width to the front to accommodate my then-huge pregnant belly. I also took in the too-baggy sleeves by an INCH each but apparently that was not enough. Construction notes: Back in 2010 I had originally been making this on the serger. When I picked up this UFO a few weeks ago the body and sleeves were together and all that remained to be done was attach the peplum and collar and sew up the belt. I finished it on my machine with a narrow zig-zag stitch. I did the topstitching and hems with a regular long straight stitch since this doubleknit is so stable. I slipstitched the inside of the collar by hand and it took me AGES—I ended up carrying it with me to playground excursions and such. A lot of work for such a mediocre result! Wear: As lackluster as I feel about this make I do still think I will wear it, mainly to work. It's warm and cozy and I got quite a few compliments on it when I wore it to work Friday—mainly due to the color, I think. Chartreuse is kind of my thing, to say the least. I have a theory that scrunching up the sleeves might help—thoughts? Successes: My first jacket! 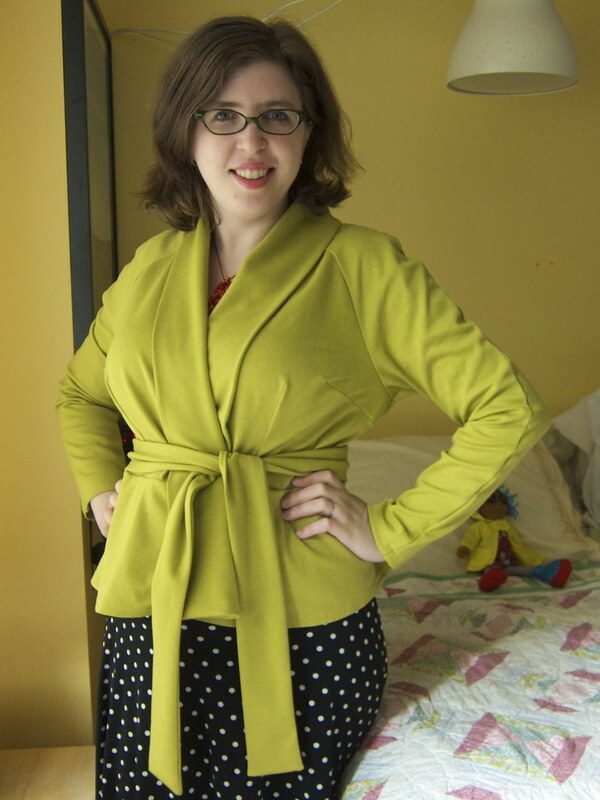 OK, so it's an unlined unfitted knit belted wrap jacket--a glorified girly sweatshirt. But still--my first jacket! Room for improvement? : The FIT! Next time I make a raglan-sleeve top, I want to see if I can make the armhole more comfortable, perhaps by adding a gusset. I suppose I COULD take it apart and alter it to fit better... but I'm just DONE with this project. Whatever. At least the unfinished object pile is TOTALLY EMPTY. For now, anyway... I doubt I will ever make this pattern again and I can't say I recommend it. Ahhhh, the perils of too much ease! I think it does work (with the sleeve crunch up option) mainly because the colour on you is divine. I think that's why I still go compliments—I just LOVE chartreuse! Ha.. if I lived close by I would lie and tell you it looks terrible and then come and take it off you! But that colour is sensational on you and I think it looks relaxed and comfortable (love it with that polka dot skirt). ha! that is very sneaky. I swear I would wear this skirt every day if I could get away with it (wearing it right now, actually). I actually really like it! The colour is lovely and even though it isn't perfectly 'fitted' on you, I quite like a more relaxed looser look of fit this season. Looks lovely with those polka dots. On another note, I too have been fooled by those cover shots enough now that I look very closely at scrunched arms or looser fitting arms to now know that this is likely to reflect my finished outfit too. Well maybe not fooled, but I used to see what I wanted to see and now I try to study them a little more objectively. I think you fitted it successfully--you're just not used to that much wearing ease. Looking at the pattern envelope examples, it fits those models quite loosely. I also notice that they either have massive shoulders or, more likely, are wearing the jacket with shoulder pads. Not huge, 1980's shoulder pads, but more ordinary, 3/4 inch shoulder pads. Personally, I put 1 inch shoulder pads in all my jackets, and some of my cardigans. Nobody recognizes them, and they make everything fit better. I agree that it looks good on you, especially with that skirt! I have heard that about shoulder pads. I think you're right that this is how it is SUPPOSED to fit and I was just envisioning something totally different. I think it's a go - sure it's a bit big but the style and colour are great for you. I say, keep it for a bit and if you never wear it, give it away. I'll be interested to see how that Carmine shrug works on you. In truth, I have seen very few versions and the ones I have seen are unflattering. The drafting creates a back panel that seems endlessly wide in a way that (at least in the versions I've seen, adds weight). Just a word of warning. Well, I've already worn it twice so apparently I LIKE wearing bathrobes. What do you mean about endlessly wide back panel? The versions I saw were quite fitted but I haven't seen many. I'm going to muslin it first, but I am fairly confident it will work. Well, I COULD but feeling like I want to move on at the moment. We'll see for next time I wear it. Hm, I admit that once you said "bathrobe" it was hard to unsee it, but I love the side view and the color! It might be that perfect cover-up to keep at a chilly office. I agree with Kelly D--and being able to rock chartreuse is no small thing. It could also serve as chic at-home "loungewear." 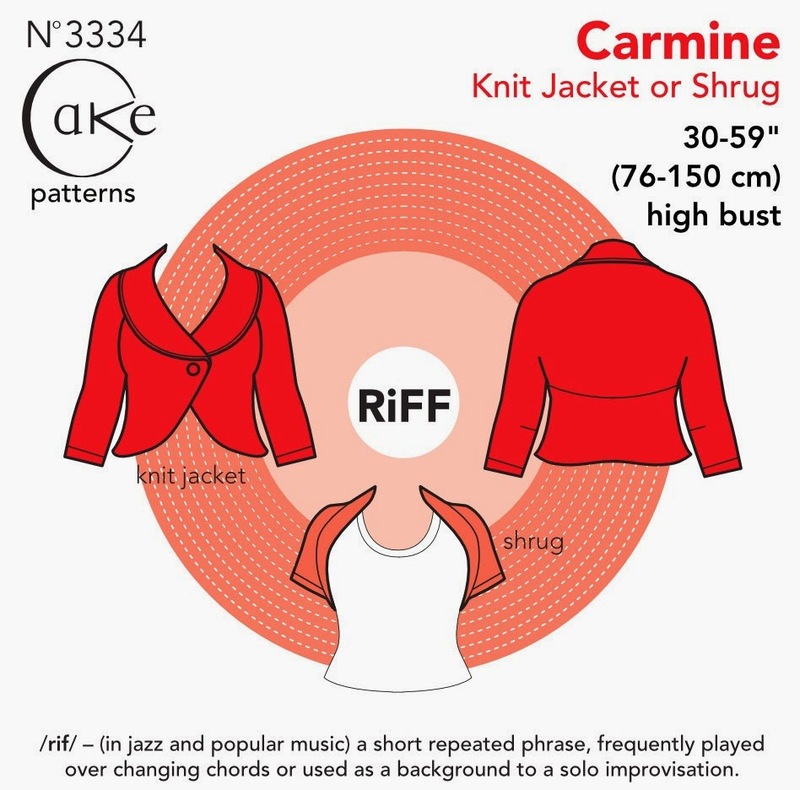 I'll be interested to see your Carmine jacket....I've been ogling that pattern for months. I think I'm going to make a bright red or blue Carmine! I think it's not bad - scrunched sleeves are in! McCall's cardigan patterns always have way too much ease... I made one that ended up a bathrobe as well. I think the problem here is compounded by it being for a knit OR a woven—I should have sized down even more. Nowadays I usually measure a flat pattern to see how much ease there is, but back then I trusted patterns more. Silly Mikhaela! I totally get where you are coming from, but it doesn't look bathrobe-y at all. As others said, it's a great color on you and the fit looks deliberately slouchy. I would keep it for those days that I want to dress up jeans a bit or have a casual jacket for a work ensemble. Yes, and it's totally good for work. Anyway, at least I finally made a jacket! Maybe someday I'll even make an ACTUAL tailored jacket. (Well, unlikely, but you never know). I think it's cute! And I bet you will wear the heck out of it during the winter. The color is great - a few months of rotating it and you will forget all about its flaws. It may not be the item you are most proud of (gosh, I have a lot of items I am not most proud of), but this is perfectly wearable - even cute! I'm shivering in my over air conditioned office right and it looks like just the thing.